This easy Kimchi recipe will teach you to make authentic Kimchi (Kimchee) at home. It’s easy to do with these simple steps! 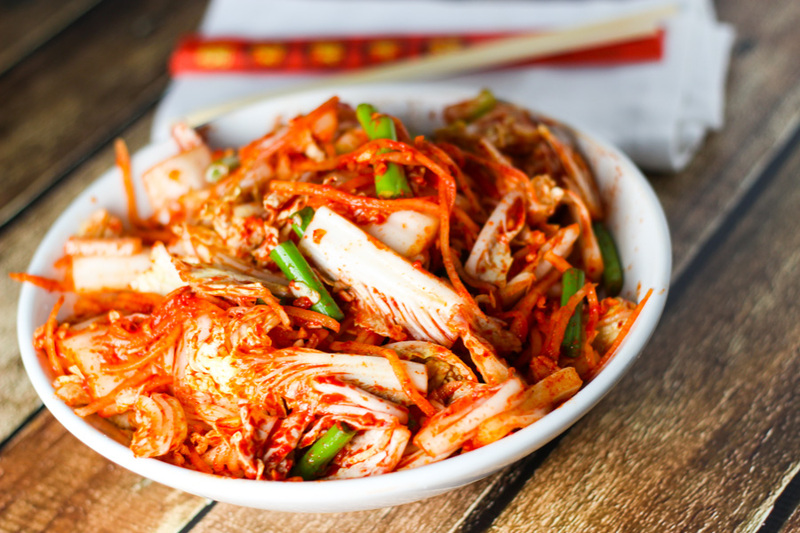 Kimchi is a traditional Korean dish of fermented vegetables, the most common of which are napa cabbage and daikon radish. 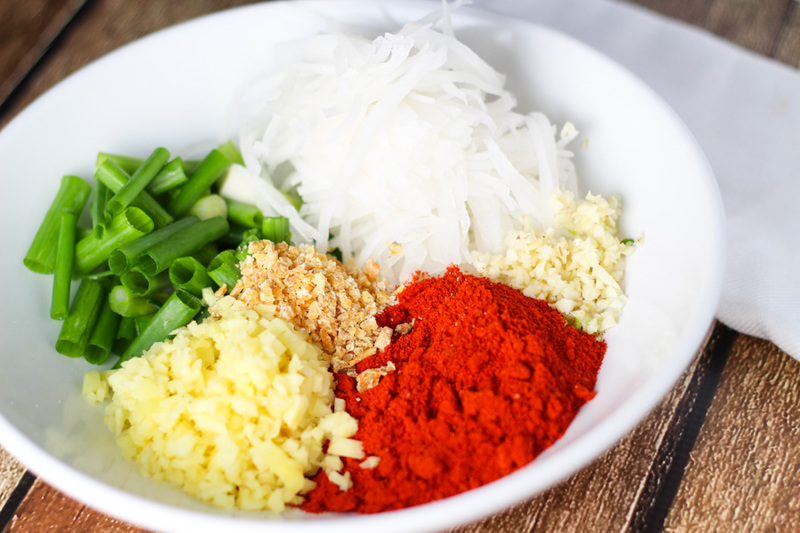 In addition to being served as banchan, Korean side dishes presented as part of a meal, it can also be used in a variety of cooked dishes like kimchi fried rice or kimchi quesadillas. I love topping these Korean (Bulgogi) Beef Tacos with it – They’re amazingly delicious! It’s also awesome on top of these Carnitas Taco Bowls with Kimchi! The ingredients in Kimchi will give you an excuse to check out your local Asian market. I had so much fun tooling around my local store and trying to figure out what everything was. So many fresh and exotic ingredients – I could spend hours just looking around and soaking everything in. If you don’t have an Asian market near you, I’ve included some links below. All of the ingredients can be ordered off of Amazon. Plan ahead: Kimchi needs time to ferment, so I would recommend starting a batch about a week before you plan to use it. It will last about a month in the refrigerator. What to buy: Korean red pepper powder or kochukaru is what gives kimchee its spiciness. It can be found in Korean markets in large resealable plastic bags, in different grades of coarseness and spiciness. Choose a grade based on your personal preference. Also known as saeujeot, Korean salted shrimp are very small, naturally fermented shrimp that impart authentic flavor to kimchi. They are sold in jars and can be found in the refrigerator case of Korean markets. Special equipment: You will need a couple of liter glass jars with tight fitting lids to hold the kimchi while it ferments. 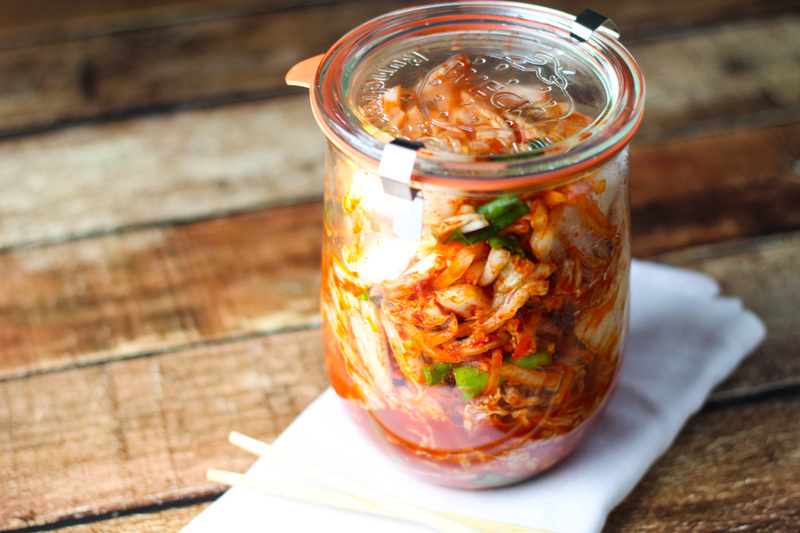 It’s preferable to not use plastic, as the odors from the kimchi can be hard to remove after the fermenting process. This easy Kimchi recipe will teach you to make authentic Kimchi (Kimchee) at home. It's easy to do with these simple steps! Cut the cabbage in half lengthwise, then crosswise into 2-inch pieces, discarding the root end. Place in a large bowl, sprinkle with the salt, and toss with your hands until the cabbage is coated. Add enough cold water to just cover (about 12 cups), making sure the cabbage is submerged. Cover with plastic wrap or a baking sheet and let sit at room temperature at least 12 hours and up to 24 hours. If you loved this Kimchi recipe I would appreciate it so much if you would give this recipe a star review! Also, be sure to snap a picture of your finished dish and share it with me on Instagram using the hashtag #platingsandpairings and tagging me @platingsandpairings. I’ve purchased kimchee at our local farmer’s market but never attempted making it myself. Maybe I will try now! It is really tasty! Thanks for the recipe! Of course Michelle! It’s great to have kimchi on hand, and it’s really not difficult to make at all! Thank you Allie! I was surprised at how easy it is to make kimchi at home. It does take a bit of time, and a few obscure ingredients (the Korean red pepper powder & dried shrimp), but it’s easy to put together. I LOVE it on these Kimchi Tacos and these Carnitas Bowls, or just by itself! I just made my new batch of kimchi last night. In a traditional Korean recipe, Korean radishes are used instead of daikon. It is shorter and fatter in shape; it has greater water content with a peppery taste. They are available at Korean grocery stores. It seems there are mom-n-pop k-stores everywhere. But if you live in and around one of the larger cities, check out H-Mart (http://www.hmart.com/) grocery stores. I don’t have one close to me so when I go to Chicago I always make a point of making a stop (tourist destination?) They have a food court and a bakery as well. If you are not in the mood to make your own, you can buy the ready-made store kimchi and they are delicious. Kimchi can be enjoyed immediately after it’s been made or after fermenting for a few days. My family enjoys it both ways but my 22 year-old son will only eat it fresh. I’ve never made kimchi but am so ingtrigued now. You make it look easy. I might give it a try this weekend. I hope you do try it Joanie – Let me know how it turns out! I love the idea of making my own kimchee. I’ve had it frequently, but it always seemed so intimidating. Now after reading your post, I think I’m ready to make it – thanks. You are welcome Laura – It’s really not too difficult at all. Waiting is the hardest part! I love Kimchee and am super excited to try this. Just wondering if you have to release the gas every 24 hours if you’re letting it ferment for a full week or is that a one time thing? Hi Netta – No need to release the gasses every day. Just the one time is great! I love kimchi..But in country the in my country(Nigeria) the ingredient are not available…..I wish I can visit Korean again…..
Do you use all 1/2 cups of salt to brine the cabbage or do you save some for the pepper paste? I have now successfully failed at two attempts and I have read at least 30 different, yet similar versions of the recipe. Is the fish sauce supposed to be sufficient salt once the fermentation is complete? You have great pictures and the recipe is well written. Please clarify. Thanks. Thank you Jeanette – Yes, you will use all 1/2 cups of salt to brine the cabbage and then it will be rinsed off. The salted shrimp and fish sauce help to provide even more seasoning as it ferments. I hope this helps! What beverage do you suggest? 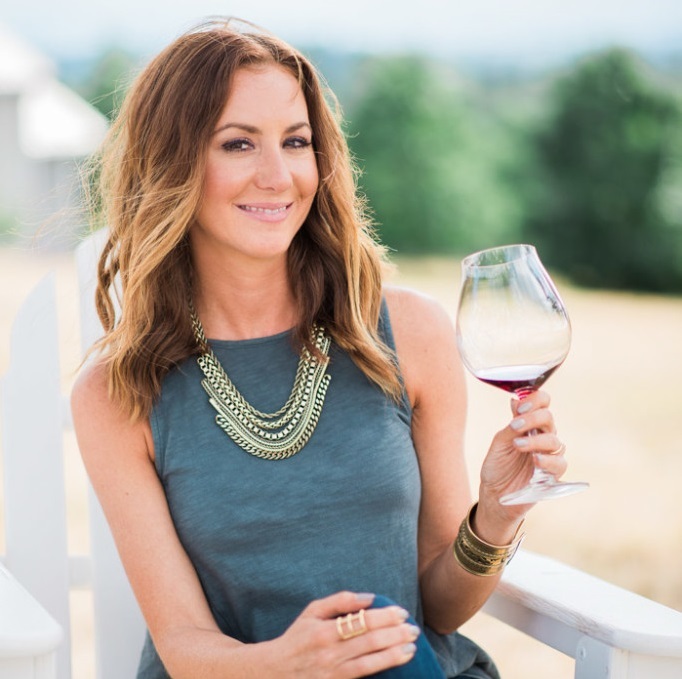 Are you asking about wine pairings? I’d probably lean towards a dry Riesling. Hope that helps! I would just add 1 technique that you aren’t really doing right. In Korea you don’t toss the cabbage with the paste. You open the leaves and rub the paste on it. Its not a big deal but that’s how its traditionaly made..
Great tips Andrew – Thank you! Andrew- you rub the paste into the leaves if you are making whole kimchi with quartered heads of cabbage. since this recipe is “mak” kimchi or “already cut” kimchi, tossing the cabbage with the paste is the only way to make sure all the cabbage gets coated evenly. I love the idea of making homemade kimchi. This looks so delicious! I usually buy it from the store but if I can make it en masse it would be alot cheaper and I’d feel better about knowing what I was eating! Thank you for sharing your recipe, I definitely want to give this a try at home next time I ferment anything! Of course Billy – I hope you enjoy! Vegetarian here, is the minced shrimp absolutely necessary? This looks too good to pass up! Both my husband and I have GERD and love kimchi. Is there a way to make it without it being so spicy? Hi Luis – You can cut way back on the Korean red pepper powder, or leave it out entirely. Hope this helps! I used to suffer from GERD, too. I found my best cure in raw fermented foods like kimchi (without too much spice at first!). Raw fermented foods are very healing to the gut. I especially enjoy a few forkfuls on my morning eggs. Hey I’m super excited to try this recipe but one question. After everything is placed in the jars you said seal it, does that mean pressure seal it? Wasn’t sure as it also states to open it after 24 hrs. Hi Melissa – No need to pressure seal with the kimchi. I made this true to the recipe, after a week I tasted it. It was abit dry, I thought it would be wetter. It was good, but shouldn’t it be moister? Should I do anything to it? Will it keep just as well? Hi Bob – It should keep well as it is! Hi, thanks for the recipe. Just wondering – when it says ferment up to one week does that mean out of the fridge? Or put it in the fridge after 24 hours but then don’t eat it for one week? Thanks for your help! Hi – This means to ferment it in the fridge. I added extra radish hoping to cancel this out. Is the kimchi prior to fermentation supposed to taste like this? I have been reading kimchi recipes but have not attempted it yet. Your recipe looks great, and I must say that reading the Q&A have been very helpful. You have been very generous answering questions. The process of Kimchi is new to most Westerners so thank you for answering questions.